For more details on specifications, each unit available and the finer details, please check out the product page itself. Manufactured by Technical Marine Supplies who are specialists in solar panels for boats, you’re guaranteed a product that will do its job time and time again. For reliability and functionality, no one does solar panels better than TMS and we’re proud to offer their flexible solar panels to our wide range of sailors from across the globe. Here at Coast Water Sports we only deal with the highest quality products and when we supply these to our customers, we know how important it is for them to get a fully working item that delivers on all expectations. 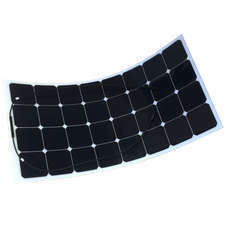 These solar panels are designed specifically for long usage and flexibility, meaning that no matter the vessel, you can get the most out of them by attaching them somewhere or laying them down in a sunny spot. To learn more about these solar panels please get in touch with a member of our friendly team, we’re always here to answer your queries, offer expert advice and guide you through the process of purchasing your very own yacht solar panels. When looking to by boat solar panels, there really is no one else who offers the same unbeatable price as us, but you’ll have to be quick, these prices will not last forever and we’d for you to miss out. If the product is out of stock, you can also contact us to find out about an update so you can grab some solar panels when they’re back in.